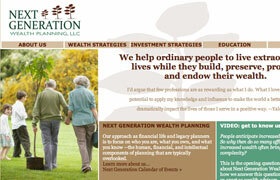 Next Generation Wealth Planning is a wealth preservation and investment group in Roseland, New Jersey. NGWP focuses on solutions and services that go beyond financial wealth. ActiveCanvas was engaged to write content and design the overall site structure and image components for the website is hosted and developed by Advisor Products, an approved website developer for Royal Alliance advisors. Our role with NGWP was cooperative in that we delivered content documents, website wireframes, and interactive media files to the developer but did not provide the HTML framework for the site. The vision for the site content was to clearly differentiate NGWP from their competitors by demonstrating a unique client approach to wealth strategies and a willingness to form alliances with other advisors for the benefit of all. On the interactive media side, we created a 3-minute introductory movie, created a revenue-generating client bookstore with recommended reading, and edited audio tapes of recorded legacy conversations. We created NGWP-branded case strategies downloads and created outgoing and back links to articles and information on the web. Other work included an updated company logo, customized map on the contact page, and a contact form designed to deliver better results for clients on call-backs.